This trivia book will indeed test your knowledge on the entire Friday the 13th franchise. With 1300 trivia questions and 13 chapters, this trivia book gives you the most trivia questions than any trivia book in the horror genre. With 100 multiple choice questions for the first 12 chapters and an amazing bonus chapter that has 100 questions mixed through 10 different parts, including a word search, who am I?, this or that, matching, multiple choice, hidden weapon, true or false, to just name a few, this trivia book is guaranteed to make you think of your knowledge, have fun learning new trivial-related content, and dive into the Friday the 13th franchise like you never have done before. This book is copyrighted under the Copyright Act of 1976 which means that all content within this book (both in physical or eBook form) is owned by its author, Scotty McCoy. Any resale of this electronic copy, or any publication, copying, or sharing through third party electronic Websites is strictly forbidden. If convicted to have resold, reuploaded, republished, or anything to violate the Copyright Act of 1976 will result in being prosecuted to the fullest extent of the law, including, but not limited to fines and fees, imprisonment, and/or any other legalities the court seems fit. 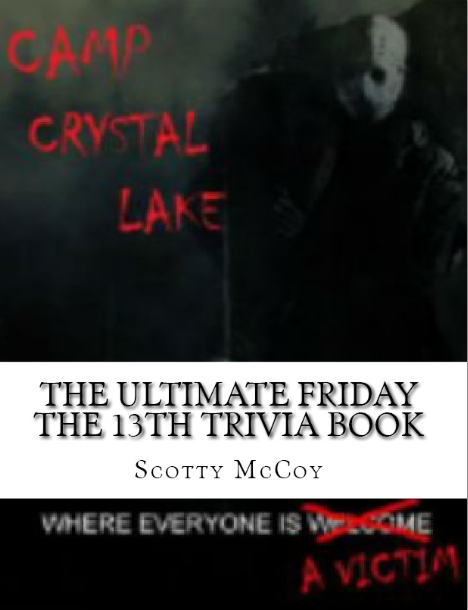 © 2016 “The Ultimate Friday the 13th Trivia Book” by Scotty McCoy.